A-list of pro-lifers to attend Oakland event later this month. Reverend Walter Hoye made headlines in 2009 when he was arrested for passing out pro-life information at an abortion facility in Oakland, California. Rev. Hoye’s peaceful action earned him a 30-day sentence in Alameda County’s Santa Rita Jail. His conviction has since been overturned. Hoye’s motivation was, and continues to be, the horrific rate of abortion in the African-American community, a rate so high that it has been described as genocide. Rev. Hoye’s website states: “Abortion, which has taken the lives of more Black Americans than heart disease, cancer, strokes, accidents, diabetes, homicide, and chronic lower respiratory diseases combined, is the number one (1) cause of death in Black America,” and he provides the numbers to prove it. On Friday, January 23, Reverend Hoye will host the Eighth Annual Stand Up 4Life Rally and Walk in Oakland. The rally and walk begin at noon at Frank H. Ogawa Plaza, in front of Oakland’s City Hall. The event will be followed by the Conversations 4 Life Dinner. One glance at the speakers list shows the esteem in which Hoye is held by the leaders of the pro-life movement. Guests include Father Frank Pavone of Priests for Life; Dr. Alveda King (niece of slain civil rights icon Martin Luther King, Jr.) from Gospel of Life; David Bereit and Shawn Carney from 40 Days for Life; Georgette Forney and Janet Morana from the Silent No More Awareness campaign; Kristine Garza and Jeff White from Survivors of the Abortion Holocaust; the Rev. Clenard Childress, director of Blackgenocide.org, and others. His Excellency Michael Barber, the bishop of the Diocese of Oakland, is the special guest. CWR spoke with Reverend Hoye last week. CWR: Tell us about the Stand Up 4Life Walk and Rally. Rev. Walter Hoye: This is our eighth annual walk. 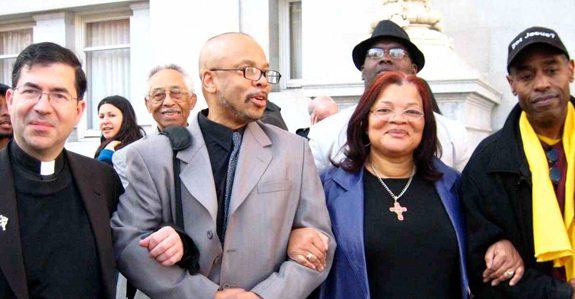 The first rally and walk, in 2008, was the result of Alveda King’s suggestion to march in Oakland…. We were on the corner of 14th and Broadway instead of at the Frank Ogawa Plaza in front of Oakland City Hall. This is because, after the City of Oakland approved our rally/walk at the Plaza, they changed their minds, put on their own Martin Luther King program at the same time on the same day, and, as a peace offering, put us on the corner. At first the City of Oakland and I were going to share speakers because I had an actual King family member speaking at my rally/walk. But when they found out Alveda and I were pro-life, they quickly changed their minds. We walked over so Alveda could say “hi” to the City of Oakland. But at first they refused us. Lori [Hoye, Rev. Hoye’s wife] and Dolores [Meehan] told the media that the City of Oakland refused to let an actual King family member say “hi” to the City of Oakland during their MLK program. As you can imagine, once the media got wind of this, the City of Oakland was in a real bind. Eventually, Mayor Dellums, who knows Alveda and was at first going to stand with Alveda during the city’s MLK program before they learned we were pro-life, made the decision to let Alveda speak while he continued to hide in his office above. Alveda and I agreed to simply keep the comments strictly about “hi” and MLK. Alveda was wonderful! She kept her part of the deal and at the end of her comments said that if anyone wanted to talk to her she was going to be on the corner. That did it! The city was embarrassed and my rally/walk drew a crowd. Incidentally, Alveda’s hello headlined the local evening news stories. Since then the city and I have not had the best relationship. But let me simply say that Oakland Police Department now loves us. I talk with the captain of the OPD every year, but because we are the most peaceful and law-abiding march in Oakland, the OPD loves us. This year’s walk is on January 23, beginning at noon, at Oakland’s City Hall. CWR: Every year after the Stand Up 4Life Walk you have hosted the Conversations 4Life Benefit. First it was a luncheon, now it’s a dinner. You have an amazing group of guests and speakers. Where did you meet them all? Hoye: Over the years, Lori and I have traveled across the country, talking about the impact of abortion in the black community and the desperate need for outreach into the communities of color. In the process, Eva Muntean and Dolores Meehan [organizers of the Walk for Life West Coast] have opened their arms of love to me and Lori and allowed us to work with them. While I’ve spoken at the March for Life in DC thanks to Congressman Trent Franks and Nellie Gray. While the march in DC is so very big and so very cold this time of year, I can tell you that the Walk for Life West Coast is a much, much warmer venue in so many, many ways. The Walk for Life West Coast is our all-time, hands-down, got to be there, don’t make us choose another event (cause we won’t and that includes our own)—our favorite pro-life event. CWR: Are tickets still available for the dinner? Hoye: Yes, but they are going fast! Dinner is hosted at St. Margaret Mary Church in Oakland. We will have three separate 20-minute discussion panels, with, as you’ve said, amazing speakers. The panels are: “Reaching Communities of Color” with Alveda King, Rev. Childress, Kristine Garza, Ana Banderas, and others; “ShockWaves! Of Abortion” with Father Frank, Georgette and Janet from Silent No More, and Bryan Kemper from StandTrue Pro-Life Outreach; and “God’s Grace In Action” with David and Shawn from 40 Days for Life, and Patricia McEwen from Life Coalition International. We also have “The Ask” with Jeff White, originally with Operation Rescue and founder of the youth group Survivors of the Abortion Holocaust. Bishop Michael Barber will be coming as our special guest, and I’ve heard Thomas Brejcha, Esq., the president and chief counsel for the Thomas More Society has bought a ticket! CWR: What is the status of your case? Hoye: My case reached the Ninth Circuit and would you believe, in a 3-0 opinion authored by Circuit Judge Marsha S. Berzon, the court stated, “We agree with Hoye that there are grave constitutional problems with the manner in which the City has understood and enforced its ordinance.” Still, because the ordinance in Oakland is based on the Supreme Court decision in Hill v. Colorado, the City of Oakland could keep the law, but had to retrain the city’s entire police force. This is another reason the City of Oakland is not thrilled with me. Even today, some members of the OPD still tease me about this. Ultimately, my conviction was overturned on procedural grounds, but not before I served a 30-day jail sentence.